Boris Johnson has insisted he is "all behind" Theresa May after setting out his own vision of Britain after Brexit. Writing in the Daily Telegraph, the foreign secretary revived the contested claim Brexit could free up £350m a week for the NHS and also said the UK should not pay for EU single market access. He later tweeted he backed the PM, who is making a major EU speech next week. Lib Dem leader Sir Vince Cable said the £350m figure was "a lie" while Jeremy Corbyn said it showed Tory divisions. In a 4,000 word piece for the newspaper, Mr Johnson expanded at length on his views about the Brexit negotiations with the EU, and the opportunities he said it would give a "bold, thriving" Britain when it leaves in March 2019. If Britain did continue its membership of the single market and customs union it would make a "complete mockery" of last year's referendum result, he wrote. Could PM's Florence speech prove a game changer? The UK, he argued, would be "roughly" £350m better off once it had "settled its accounts" with the EU and he said it would be "fine" if "a lot of that money" was spent on the health service. Writing later on Twitter, Mr Johnson said that he was "looking forward" to the prime minister's speech next Friday in Florence - in which she is expected to set out details of the UK's "special partnership" with the EU after Brexit. "All behind Theresa for a glorious Brexit," he wrote. 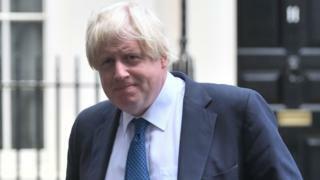 The BBC's political correspondent Leila Nathoo said that although sources close to Mr Johnson insist his article has nothing to do with leadership ambitions, the intervention has revived speculation that he is still eyeing the top job. Asked for her response, Home Secretary Amber Rudd said she was focused on co-ordinating the government's response to the Parsons Green bomb attack and had hadn't a chance to look at the article. But Sir Vince Cable suggested the foreign secretary was pushing for "a far more extreme" version of Brexit in pursuit of his own personal ambitions. "On his central point, the £350m a week, this is a lie. He knows it is a lie and endlessly repeating it does not make it the truth," he said. And the Lib Dems Brexit spokesman Tom Brake told his party conference - which began on Saturday - that far from enhancing the NHS, the UK's exit would have a "calamitous effect on our cherished public services". Chancellor Philip Hammond has suggested there is a consensus in the cabinet for the need for a transitional period of several years to minimise the disruption from Brexit - which would "look a lot like the status quo" in many ways. This has prompted unconfirmed speculation that the UK could potentially pay the EU for a limited period of time to continue to access the single market on an existing tariff-free basis. Labour leader Jeremy Corbyn said Mr Johnson's comments "laid bare the conflicts at the heart of Theresa May's government over Brexit" and undermined the prime minister's authority. He said: "The foreign secretary even has the gall to dredge up the fantasy of £350m a week extra for the NHS. "The prime minister must spell out now how this will be paid for, or stand condemned for once again trying to mislead the British public." In the run up to the referendum, the Leave campaign - of which Mr Johnson was a key figure - claimed the UK sent £20bn a year, or £350m a week, to Brussels in 2014. Vote Leave emblazoned the figure on its campaign bus and said the money could be used to fund extra spending on public services such as the NHS. But a letter from the head of the UK statistics watchdog Sir Andrew Dilnot during the referendum campaign described the figure as "potentially misleading". The claim that the UK sent £350m per week to the EU is wrong. Boris Johnson and other Leave campaigners claimed that in the calendar year 2014, the UK gave £350m per week to the EU. The UK's gross contribution was actually £361m, but - crucially - the rebate is removed before any money is sent to the EU. So the amount sent to the EU in 2014 was £276m per week, after the rebate. The Vote Leave campaign's claim argued that the money could be spent on the NHS. Well, it could, but that would mean cutting all the money the EU sends back to the UK, for example on farming subsidies and grants for community projects. That was in 2014. The amount the UK sends the EU has been falling. In 2016 it sent £252m per week to the EU after the rebate, the lowest since 2012. Reality Check: Are we giving £350m a week to Brussels?